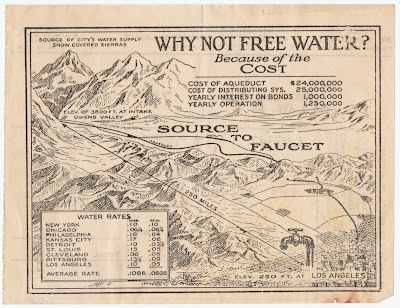 I found this map created by the Los Angeles Bureau of Power and Light in 1922 via the Cornell University Library's Persuasive Maps collection. It appeared on the back of an electric bill and was meant to explain the cost of water. There is a chart of water rates comparing LA favorably to other cities. I like the title "Why Not Free Water? Because of the Cost." It does a good job of breaking down the costs of the 250-mile aqueduct and distribution system. I stumbled across the map above while looking for the one below. It appeared in some marketing materials and makes a nice modern contrast to the Cost of Water map. It is a different era but the water issues are even more urgent. New York City's water system delivers over a billion gallons of water each day to 9 million residents. The length of the aqueducts and reach of the system is impressive - 1,972 square miles of drainage systems flowing into an aqueduct that crosses the Hudson River. That's a lot of cost for water- think about that next time you leave the faucet running.